Ever want to just get on your bike and ride? Leave the power measuring devices behind? Maybe head to the local bar—or a bar three towns over? Possibly hit up some trails on the way, just because they’re there? Or maybe you dig singletrack, fording streams while shouldering your bike … anywhere you’re truly free to go. There’s a bike for all of that. Not a road bike. Or a mountain bike. Not even a cyclocross bike. Meet your new partner-in-adventure, the adventure bike. Last year, we were calling these kinds of bikes “gravel grinders,” or “adventure bikes.” Now, they come in all different forms but the function is the same: to ride anywhere, with anything. But before you head to your nearest bike shop to demand that the sales clerk introduce you to your cycling soulmate, consider these. The obvious: What level of rider are you and what riding experience do you have? Raleigh has a wide variety of geometries that accommodate everyone from beginners to race-ready riders. Where do you ride, and what is the weather like? Could sleet or snow sneak into your derailleurs and mess with your shifting? Maybe a singlespeed is a good option. Have serious weather and serious hills throughout your city? The internal hub is a better choice. What’s the riding like? Are there stoplights on every block where you will need to put a foot down? You may want a more aggressive brake (think discs). What kind of riding are you doing? Are you riding three blocks to the office, or are you grinding out 15-mile trips to the shop, plus some adventure riding on the weekends? Identify the right frame for your ride types. What are you carrying? Do you need panniers or prefer a backpack? Will this be a multi-use bike, i.e. will you be racing on it? If you’re considering dabbling in road or cyclocross racing, an adventure bike may be the best solution. The slacker geometry will allow for a comfortable commute, but a quick tire or wheel change-up will have you race-ready in no time! On the topic of keeping winter weather out of your bike, especially those parked outside all day, internal hubs are one of smartest trends in winter commuting. Barring a once a year (or every 500-1000 mile) check-in at the shop, the internal hub should be maintenance-free. Singlespeed is another simple option. For a flat area, it’s a great way of keeping cost and maintenance of a bike to a minimum. If you’re planning to leave your bike locked outside for long periods of time, consider one of the bikes with an understated paint scheme. While the cool colors of the RX Pro are dazzling, the gravel Port Townsend may be just a bit safer locked outside of the bar. Lastly, make sure you pick up the most important piece of gear for any cyclist: a helmet. And maybe some shoe covers too. It’s chilly out there! 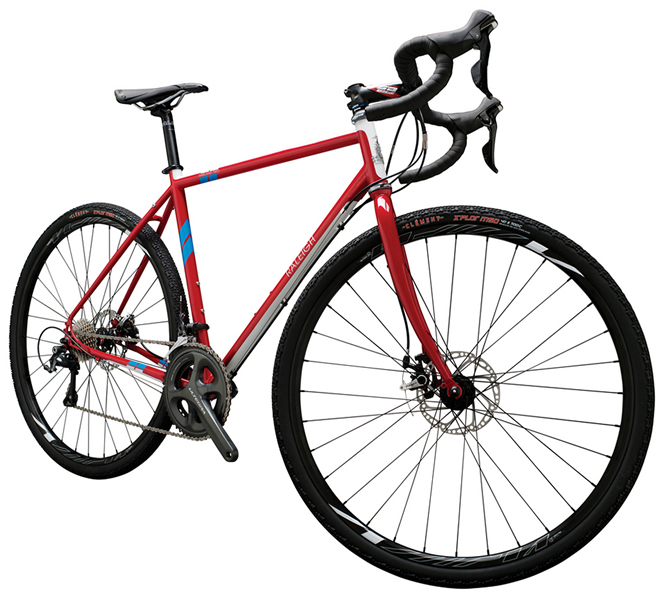 Roper: Best for cyclocross-interested commuters with an eye for steel and disc brakes. Tripper: For those who want a sleek commuter with internal hub. Furley: For singlespeeders who want to hit the singlespeed ’cross scene next fall. Port Townsend: For serious all-weather commuters who may be considering a tour this summer. Sojourn: For riders drawn to a bike’s elegant, classy style (they’ll commute in a tweed coat instead of spandex, thank you very much). Tamland 1 or 2: For gravel-grinding adventure riders with rugged roads around home and a love of miles, miles and more miles. RX 1.0 (or any ’cross models): For riders looking for a model that can flawlessly transition to ’cross racing.